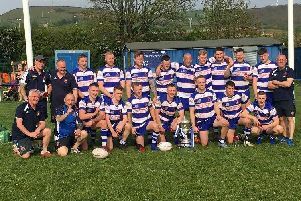 Siddal came through their toughest test so far this season in the National Conference League’s top flight with an 18-14 success at Rochdale Mayfield. Gareth Greenwood’s side made it four wins out of four and trail only fellow 100 per cent side Leigh Miners Rangers on points difference at the top of the table. Siddal led a feisty encounter by 12-10 at half time and came out on top after an attritional second half. Winger Scott Caley scored two tries for the visitors and stand off Shaun Garrod and prop Iain Davies got the others. Chris Brooke added one goal. Forwards Sean Watkins and Callum Marriott and stand off Paul Brearley crossed for the hosts and scrum half Sam Butterworth kicked one goal. Siddal are back on the road again on Saturday when they face Egremont, who got off the mark for the season at the fifth attempt with a 26-20 home win over Hull Dockers at the weekend. Elland’s problems in Division One increased with a 72-6 defeat away to leaders Milford Marlins. The next-to-bottom side, who have only one win in six, are at home to fellow strugglers Shaw Cross Sharks next Saturday.